The Expedir is a mid tail cargo bike, not quite as long at the back as a Yuba Mundo but still able to carry a very reasonable 120kg of cargo. The Expedir a cargo bike with unrivalled pulling power that's easy to handle, quick to get on and off and can park in places where normal bikes fit. 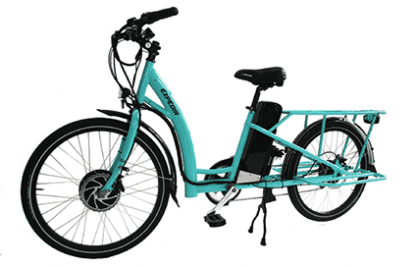 With the rear wheel at 24″ and the front at 26″, the cargo area at the back is a bit lower which makes for a nicer ride when carrying gear and a bike that's easier to balance. Another unique trait is the low step through' (LST) model offered on the Expedir. The LST is particularly useful for shorter riders or anyone who isn't super confident riding heavy bikes as it allows them to get on and off easily. A common issue with a long tail bike is that with a child on the back a rider might have to tilt the bike over a bit in order to get their leg over the cross bar. The LST doesn't have that issue, you can step right over with the bike in its upright balanced position. The low cargo rack at rear and reasonably short bike overall makes for an easy handling cargo bike. It is the Cromoly steel frame has allowed the low step through design to be made without compromising structural integrity. The Expedir is a true electric bike, not a conversion. This means the battery comes out using the normal flip seat method, and it doesn't interfere with cargo space.